EPIC POST! Yes, this is super epic guys. I spent the week celebrating Thanksgiving (which happened in October in Canada and hasn’t even happened in the US, yet). But that doesn’t matter because I wanted to make sure that you had all you need to make all the traditional holiday sides, totally vegan fabulous. Don’t you worry your pretty little heads, I will be posting some awesome mains too, but I wanted to make sure I got the basics out there. Whether you are hosting a large gathering, attending a potluck, or just chilling at home, these recipes will please everyone. I’m not saying they will please just the vegans, put these dishes on the table and no one will be complaining… well people might complain when it’s all gone. If you have any traditional sides that I didn’t include and would like to serve, leave a comment at the bottom of the page, and I will give you pointers on how to veganize your holiday season. To make your life easier I included these prep ahead tips below. Whether you are making all of these dishes, or just a couple, you can use these tips to get most of the work done ahead of time so you can be all smooth and cool on the celebratory day. 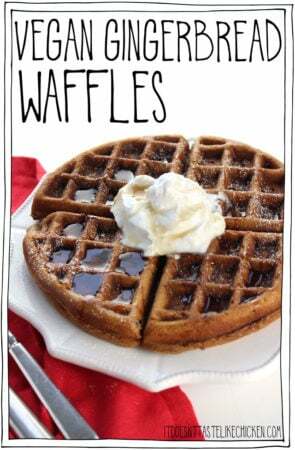 I also made these recipes printer friendly, so you can print, share, bookmark, pin, tweet, or however you like to save your recipes. Print, save, share, or bookmark these recipes. Make a list, check it twice, and get all your grocery shopping done! 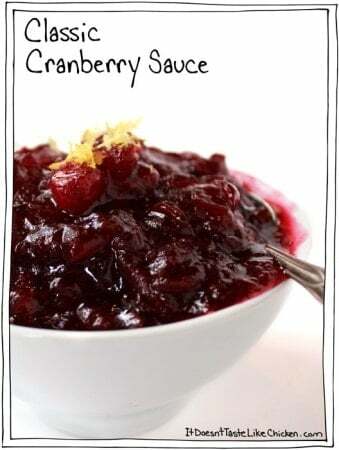 Make the Classic Cranberry Sauce. Make the Quick Onion Gravy. It will turn into a solid jelly like blob in the fridge… yummy… When you are ready to reheat, warm over medium low heat until it returns to liquid. Add more broth to thin as necessary if needed. 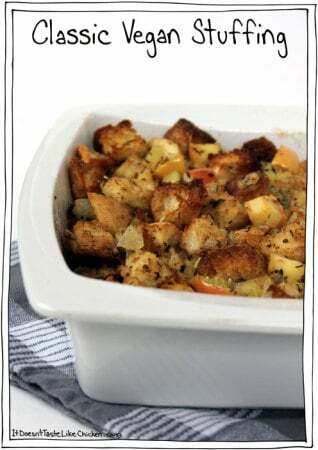 Slice bread for stuffing and set out to get stale. If you haven’t sliced your bread for the stuffing yet, make sure you do that today. This is a must. Mince 12 cloves of garlic (or enough for each recipe) and store in an air tight container in the fridge. Chop up any other veggies you would like to get out of the way, onions, celery, mushrooms, brussel sprouts, and green beans. You can cook the green beans according to the directions so that’s all done as well. 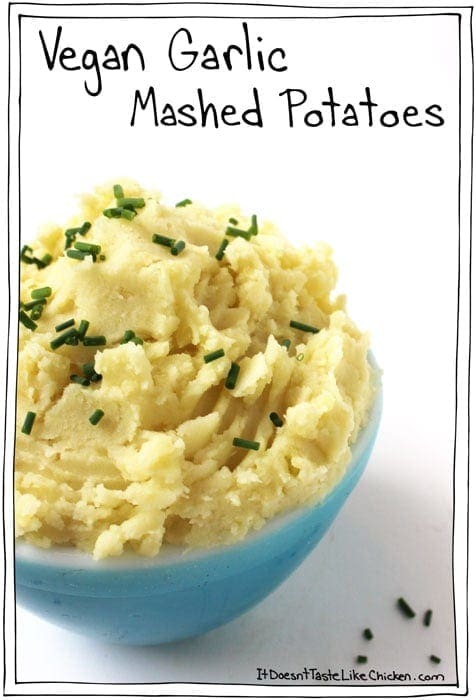 Peel potatoes for mashed potatoes and store in a bowl or pot covered with water in the fridge. Drain off water and add fresh water when you are ready to prepare the recipe. Make the French Fried Onions and set aside on plate covered with paper towel. Make biscuits and wrap in cloth napkin to keep fresh. Warning, make a double batch as you will want to eat them all! Make the Classic Vegan Stuffing up to the point where you cover the dish with foil. 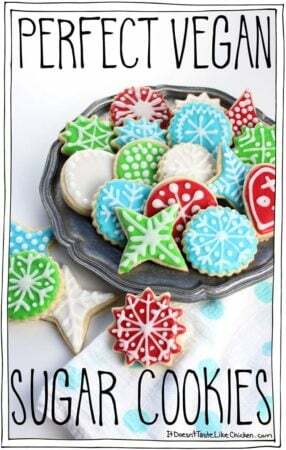 Set aside until you are ready to bake. Previous Post: « Vegan Things I ADORE! I’m excited to make the onion gravy along with the stuffed butternut squash. Both recipes call for 1 yellow onion. Can you give a measurement for the chopped onion, such as 1/2 cup, or 2 cups, etc? The size of yellow onions can vary GREATLY. Thanks so much. Omnivore hubby is not a fan of sauces such as gravy and asked me to make only enough for myself bc he would “only try a spoonful” along with your pumpkin shepherd’s pie. Hahaha, good thing I didn’t listen & made enough for 2 anyway, bc he ended up gobbling up 3/4 of the entire sauce & had to admit it was “really good” :-D. Thanks! 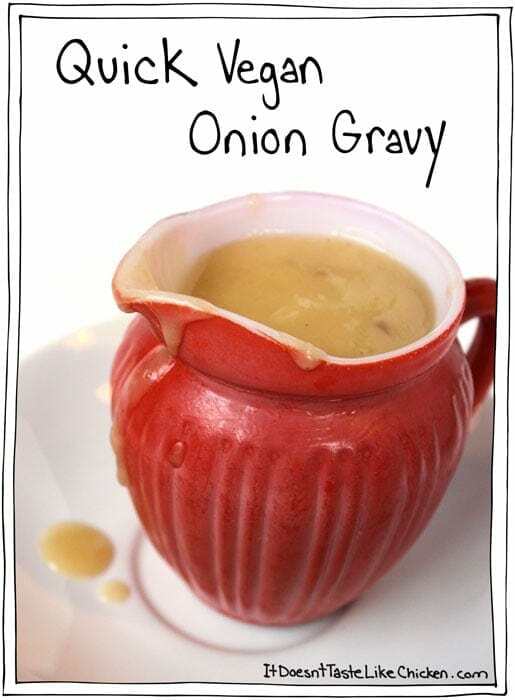 Just made the gravy – amazing!!! I’m waiting for my potatoes to finish cooking and I’m just eating it straight right now haha! Haha! Awesome. So happy you enjoyed! you’re my hero!!! i went vegan this summer. I’m going home from college this christmas and am making my (recently vegetarian but soon going vegan thanks to me) family these wonderful goodies! 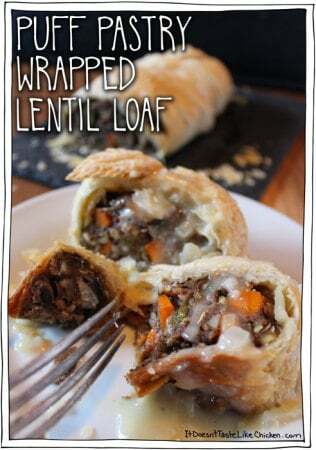 also will try to make that amazing puff pastry lentil loaf!! IM PUMPED. Thank you so much for the recipes! This was such a huge hit with my husband and his friends, who are not vegan 😉 That’s a win for me! Happy Holidays! Do you think I could freeze the stuffing ahead of time? Last year I made all of these and it was a hit but this year I won’t have much time so I’m gonna start preparing from this weekend. I’m afraid if I do then things will be mushy from being frozen :(.. How do you think I should go about freezing the stuffing? My partner and I recently went vegan and were worried about coming home and doing traditional Thanksgiving dinners with our families. I made all the side dishes, including your glazed carrots (subbed with maple syrup), the stuffing, and the gravy. Everything at the table was vegan (except for turkey, of course), and our guests couldn’t tell the difference. We loved your recipes and they were beyond easy to make. So glad that we could enjoy our holiday without compromising our diet or making it a huge fuss for everyone else. Thanks so much! Will be using these again in the near future. That’s so amazing, your Thanksgiving sounds delish! So happy you enjoyed, Vee. 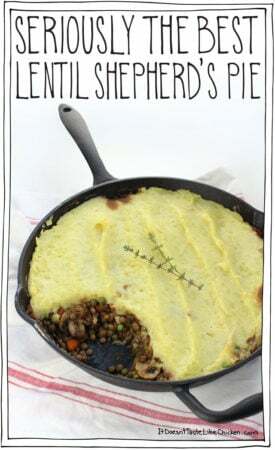 If you are looking for a vegan centerpiece as well, I recommend my Puff Pastry Wrapped Lentil Loaf, my Stuffed Roasted Butternut Squash, or Lentil Shepherd’s Pie. Omnomnom! just made green bean casserole and glazed carrots as an afternoon snack, my GF and I enjoyed them very much. The quick onion gravy is “the best brown gravy I’ve ever had” said my meat eating husband. I agree. This is a definite keeper. Thank you for this awesome recipe. Thanks for your response and the info on the wild rice. I do use your recipes, the ones where I can eliminate the oil and full fat coconut milk. I have left out enough oil to sink a battleship over the last 15 years! LOL!! Thanks for sharing your creativity with all of us, and as you said, I will use what I can! I do like your gooey cheese, both nacho and mozzarella and your artichoke dip is great. So again, thanks for wooing carnivores over!! These recipes as written are certainly not low fat. We subscribe to the Esselstyn and McDougall no oil added plant-based way of eating. These recipes are examples of why just saying vegan doesn’t mean healthy. Way too much olive oil, full fat coconut milk and vegan better. I never use any of those and make delicious recipes. 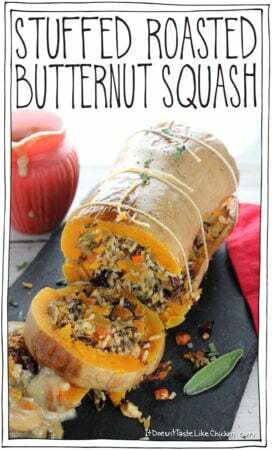 I plan to try the stuffed butter nut squash. Is that enough time for the wild rice to cook? My experience (15 years of this way of eating) is that wild rice takes a lot longer than that in order to fully fluff. I’d be interested in your response on that. I don’t claim these recipes to be low fat. I know about McDougall and Esselstyn very well, but this blog is not about their diets. If my recipes are not to your taste, there are many health focused vegan blogs on the internet. I’m vegan, and my recipes are vegan (not oil-free plant based). My goal is to create scrumptious, hearty, familiar, recipes that will woo any meat eater to the greener side. Yes, the wild rice cooks for 20 minutes and was lovely and cooked to perfection when I tested the recipe, although I am guessing that different types of wild rice my vary slightly. I just had to let you know that your onion gravy is one of our staples. It’s so easy to make, tastes amazing and I usually have to make extra just for my husband. We made the onion gravy as a vegan Tday encore. Gorgeous! 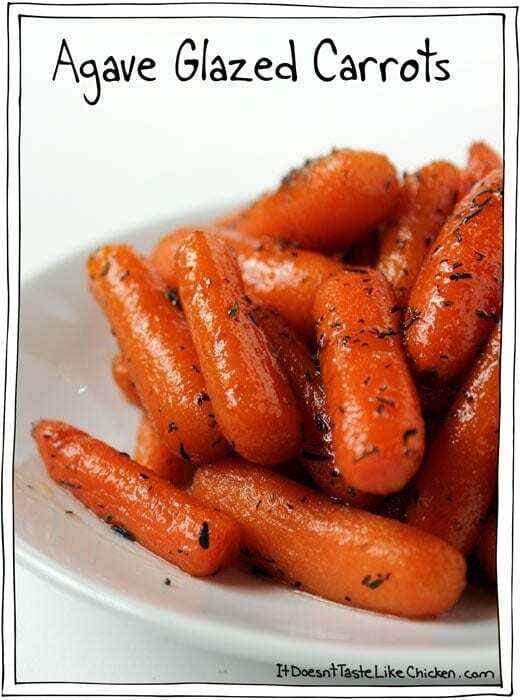 So simple and incredibly flavorful. Turns leftovers into deliciousness. Can’t wait to try the rest of the lineup on this page. Thank you!! Yay! So happy you loved the gravy Nina. I hope you enjoy all the recipes you try next too! 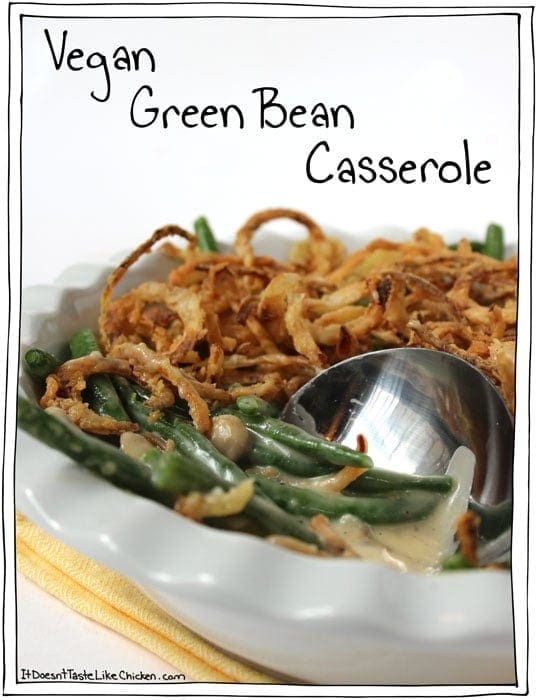 I made the green bean casserole for a thanksgiving themed vegan potluck last weekend and it was. SO. GOOD. I was the star of the show. Making the mashed potatoes now and will be making the casserole again for my family’s thanksgiving. Thank you!!! This is a free recipe that can be adjusted. Being a passive/aggressive “Know it all” is not necessary, Sarah. There is a big difference if one is cooking on a gas stove vs an electric, also. Thank you Julia! 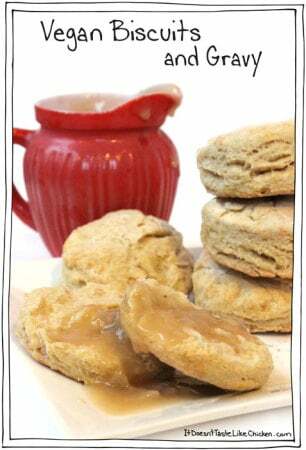 I don’t think I have ever had vegan biscuits at a restaurant… Thats the beauty of making them at home, you get to make anything and everything you want! I just made the mashed potatoes and they are honestly the best (vegan or not) that I’ve ever had, and I LOVE mashed potatoes! So thank you for this awesome bowl of yummyness! I need to send this to my very Italian and very “what’s a vegan?” mother and show her that yes, I still can eat, let alone eat very well, without meat or dairy. 🙂 Thank you for all of these amazing recipes, I can’t wait to try them! Fabulous round up Samantha! It all looks delicious, but I am totally eyen’ your green bean casserole and Brussels sprouts! Thank you! Yeah it is nice to have is spaced out here, not so much to do at once. I hope you have a great Thanksgiving vacation… or work trip, I am hoping for your sake, vacation. Love this! Who says you can’t have a vegan thanksgiving?! Epic is right! I put together this huge Thanksgiving post a few years ago on my blog but didn’t even include new recipes or pictures, and I thought that was a ton of work. You have nailed the whole vegan Thanksgiving, Sam! Aww shucks! Thanks Cheryl! Yes I saw your Thanksgiving post, it was epic! Fist pump for epic recipe posts! haha. Check out Daphne Oz’s Vegetarian Mushroom Gravy. It seems that the recipe has disappeared from the web site. I am on your subscriber list. 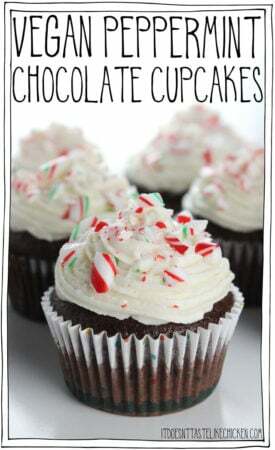 If you would like the recipe, I can send to you. I substitute butter flavored olive oil for the butter, but you can use whatever fat you want. I made this for the first time a few years ago. My family demands this gravy every year (even the carnivores). I usually go to my local Asian market to get a good variety of mushrooms. My base is always mini bellas. This is a wonderful gravy. Yum, I love mushroom gravy too! I like this onion gravy because it is so quick and easy, but please feel free to go for any vegan gravy you like! Thanks for sharing LynnE. There’s butter flavored olive oil?!! Yum! I’m making this stuff. Just most people don’t realize white sugar isn’t vegan since it’s processed with anim bones. I’m going to find that olive oil! It actually depends where you live, white sugar is often processed with bone char in the US, in Canada, most of the sugar brands are not processed this way and are vegan, and the same goes for other countries as well. To make sure you are getting vegan sugar in the US you can look on the company’s website, or buy organic sugar which is always vegan. Hope that helps! 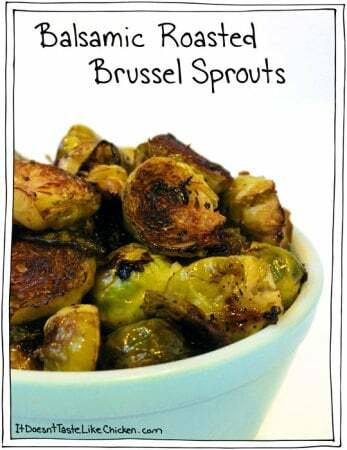 How did you know that for this year’s Thanksgiving feast, I’m in charge of brussel sprouts AND stuffing?! Plus, I was going to make a vegan gravy for myself. Thank you, thank you! 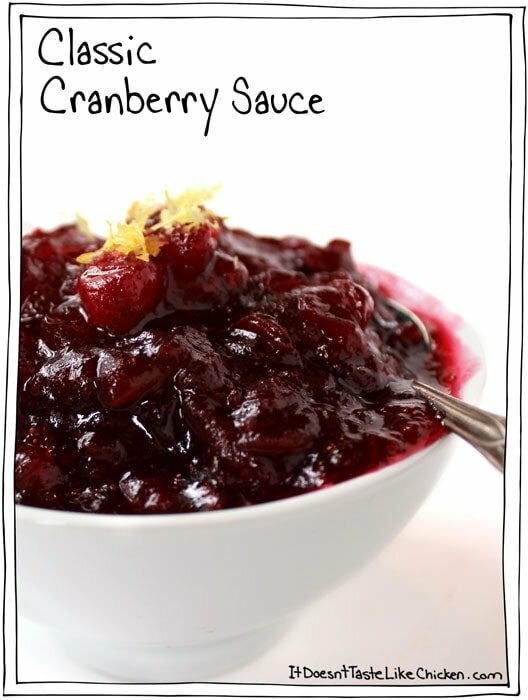 These are awesome recipes for Thanksgiving! Definitely going to try the biscuits and gravy! Thanks Lisa! Yeah it was really hard not to eat all of the biscuits while taking these photos! I had to keep swatting away Andrews hands! haha.